As the debate over construction of a wall on the US-Mexico border rages on in Washington, filmmaker Ben Masters (Unbranded), ecologist Heather Mackey, conservationist Jay Kleberg, wildlife photographer Filipe DeAndre, and Rio Grande river guide Austin Alvaredo set out to transform the perception of the borderlands region. Embarking on a 1200 mile journey from El Paso to the Gulf of Mexico, the five environmentalists document the wild natural beauty of one of the North America’s most diverse ecosystems and address the impact of a proposed wall on the region’s many inhabitants, including an interview with Democratic presidential candidate Beto O’Rourke. Stunning landscapes, beautiful wildlife, and genuine moments of comradery, jubilation, and peril punctuate their adventure through this misunderstood and imminently threatened natural wonder. An elegant awakening to the realization that nature and the beauty of the wilderness are far greater than all of us. After receiving his B.A. 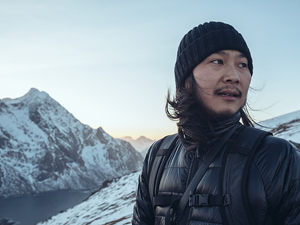 in Human Geography, Goh Iromoto’s curiosity of the human spirit led him to a career in documentary and travel filmmaking. Everything he learned working in these genres continues to have a huge influence on his work. Iromoto has received several awards including the Canadian Society of Cinematography for his film We Belong to It. In recent years, Iromoto’s film The Canoe has also been featured in numerous film festivals and the National Geographic Short Film Showcase.